Creating peace of mind for our customers since 1985 in Houston, Texas. We can help keep your lawn looking healthy, green and luscious year round. St. Augustine sod installation for new client. 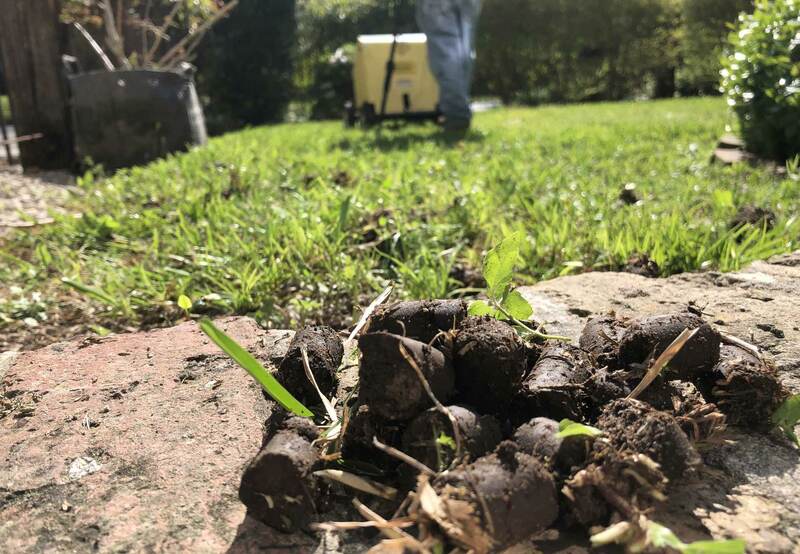 We can help your lawn breathed much better during the Spring and Fall with our core aeration services. Black star gravel pathway for existing client in Lazybrook/Timbergrove. A luscious and beautiful winter lawn by Fermin Lawn Maintenance. Resode entire front yard for existing client. Hire professionals to provide you the lawn service you expect. Dwarf mondo grass application for existing client. This traditional evergreen is a durable groundcover that can make your landscape setting look attractive. Does your neighborhood have lots of trees? Is your lanscape covered by leaves all fall/winter? Our basic options takes care of unwanted leaves on your lawn. During the winter the leaves sometimes hide the mulch in your flowerbed. Our full maintenance option includes cleaning your flowerbeds as needed. Rye grass is one of the cool-season grass choices available for Houston, Texas residents. Client was getting ready to put the house on the market. We were called to provide a full manicure service including trimming and pruning of the 2 big trees in front of the home. Vacant CiCi's in Houston had not been service in over a month. Overgrown hedges needed to be trimmed. Maintenance of hedges and shrubs is part of our full service option. 2 of 18 trees trimmed and pruned in the Lazybrook/ Timbergrove area of Houston. Client did not want the tree anymore. Garden with Star Jasmine climbing up a fence with criss-cross wire against it. We prevent them from getting bushy. The growth we’ve experienced over the years is because of our customers. Well groomed lawn in Houston ready for the weekend festivites. We work hard to keep your business landscape looking clean and in top shape. New client called about overgrown grass. Her lawnmower kept turning off. No grass is too high for us. Fresh + polished looking lawn for our client in Houston. Creating clean landscapes for our clients. These American Holly trees needed a trim. Amercian Holly tree after its trim. Holly Trees look best with their ornamental shapes. Jasmine wall cover nicely trimmed. Did you know they have a very lovely scent?